Summary: The Henley rower is a budget model from the respected Marcy. This brand is famous for their weight training equipment, and the solid build quality continues with their fitness machines. You’ll get a fold away rowing machine, with 8 levels of magnetic resistance, an aluminium rail and LCD display. This model comes with some hidden features which other budget rowing machines won’t match. It is no ‘Concept 2’, though as a simple home model it ticks all the right boxes. You can see the gallery, buyer feedback and check the latest price on this dedicated amazon.co.uk product page. You’ll get a smart, black and silver rowing machine made from a mix of aluminium, steel and tough plastics. When it is unfolded the Henley is 183cms long, 78cms tall and 56cms wide. The rail folds almost vertically, cutting the length to 93cms (though obviously increasing the height). This machine weighs in at 26.5kg. Marcy recommend it for users up to 6 feet tall, and 17.3 stone. The flywheel gives you 8 levels of resistance. To change these, you’ll use a large dial on the base unit. A smooth resistance is maintained by the 4kg flywheel. This is on the lighter side. While it can’t compare with commercial models, this should be plenty enough for home use. There are two extra features to keep you comfortable while you work out. These are a larger than usual padded seat, and pedals which swivel. Moving pedals allow you to find your natural position for your feet – reducing pressure on your ankles. You will also find a unique ball-bearing setup between the seat and the aluminium rail. This keeps your movement both smooth and quiet. Compared to some rowers, the LCD display is basic. This simply measures your speed, time, strokes per minute and that all-important calories burned. Some feedback from previous buyers noted that there was no distance displayed… this does feel like an oversight – many people use a fixed distance as their target for each workout. Considering that this is a budget price-range rowing machine, the feedback is very positive. I always look for phrases and ideas which come up again and again in the comments from buyers. This time the comparison to Concept-2 rowers (and commercial models in general) was the reoccurring theme! These were in the context of ‘it’s no Concept 2, though for the price it is good value’ (and variations around that idea). The value for money theme came up many times, and the fold-feature also came in for some praise. Negatives focused on the belt, with a couple of disgruntled buyers needing this replaced. The excellent service from Marcy (fast and free replacement in one case) does not seem to have been enough for those affected to improve their ratings! For a budget end rowing machine, the average of the feedback is excellent – add to this the 2-year Marcy warranty, and you can buy with peace of mind. Wrapping Up: Is the Marcy Henley Rowing Machine Right for You? As budget rowers go, there is a lot to like about the RM413. For a start, Marcy have been building solid, reliable machines for decades – and have a reputation for first class customer service. While the spec of the Henley is not stellar, it is more than good enough for home use. 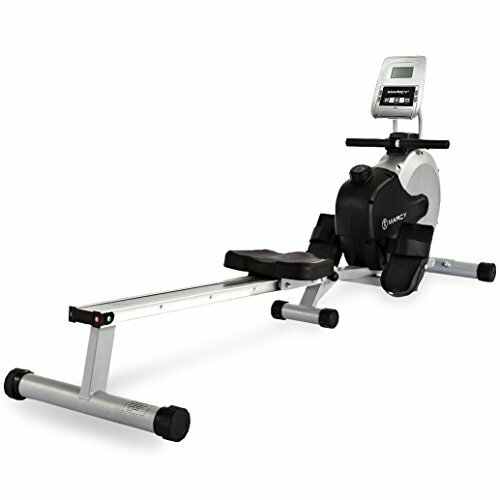 With 8 levels of magnetic resistance, this rowing machine will challenge you even if you are an experienced rower. In the words of several buyers who left feedback, this is no commercial rower! What you will get is an effective fold away machine that is perfectly suited for home users. Check out the feedback, gallery and the latest price for yourself now on this dedicated amazon.co.uk product page.